Click on the 173rd Patch, below, to visit The 173rd Website. CHECK OUT "NAM MAGAZINE" BY CLICKING HERE!!! I volunteered for Vietnam service while in Special Forces training at Fort Bragg. The endless stream of dots and dashes in Morse Code training just wasn't for me. I arrived in Cam Ranh Bay on 27 May 1969, feeling "10 feet tall and bulletproof", a typical gung-ho Airborne cherry. The first night in An Khe brought my first experience with incoming rockets and mortar fire. Scared and shaking, huddled in a bunker with the other "FNG"s, my attitude changed right then and there. Surviving this place became "not a sure thing". 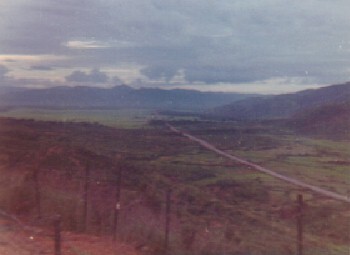 After Jungle School, I was sent to LZ English and, since my MOS was 11Charlie, I was assigned to the Echo Co. mortar platoon on " The Hill" over looking Bong Son Pass. View from "The Hill", North toward Bong Son, QL-1 is at the right. 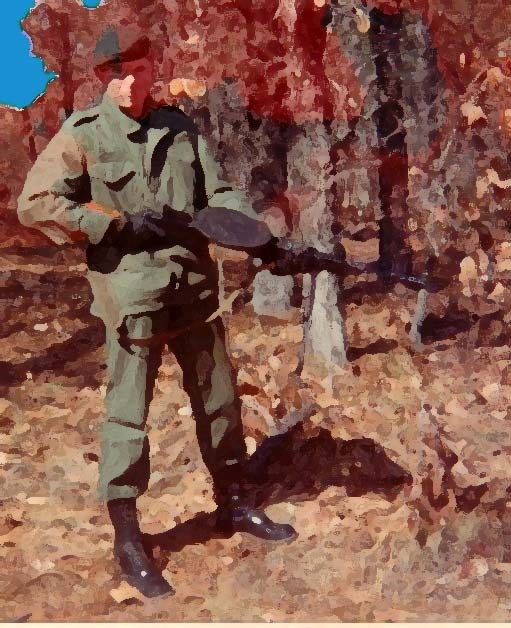 "Cherry Photo" of me, PFC Lynn Grover, taken at Jungle School, June,1969. In 2003 the 173rd Airborne Reunion was at the Peppermill Hotel/Casino, in Reno Nevada. I was able to meet-up with buddies from The Herd that I hadn't seen in over 30 years. Charlie Rolon, Al Buckholz, Jim Gore, Billy Soza and our old Lt., Dean LeVay were all Wildcats that I served with proudly and partied with at the reunion. 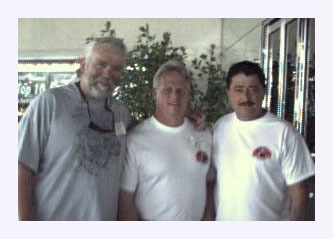 (Above) Me with Al"Buck"Buckholz and Charlie Rolon at the Peppermill Hotel in Reno Nevada, June 7th, 2003. It would be great to see more of my old buddies in Daytona for next year's reunion! 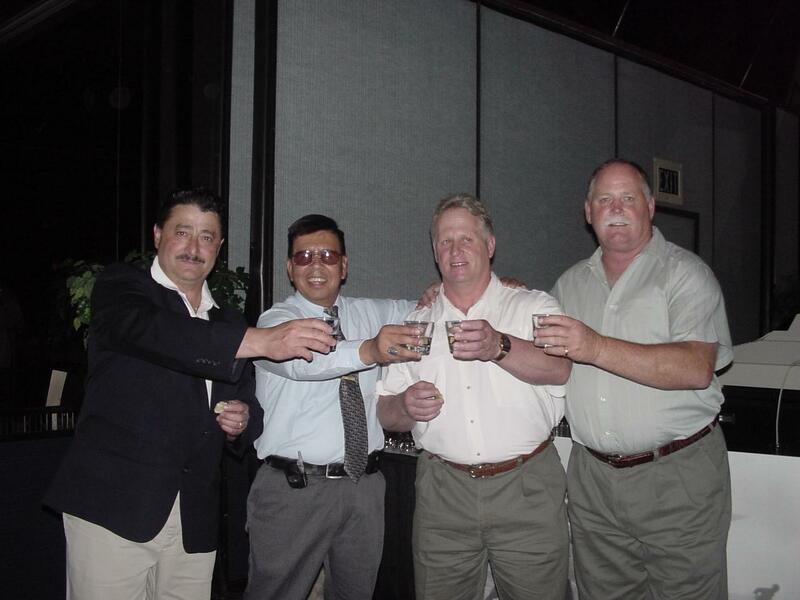 (Below) Charlie, Billy Soza, Buck and Jim (Doc) Gore, Reno, 6/7/03. Wildcats together again! Don't forget to look at my other pages for many more photos and stuff! 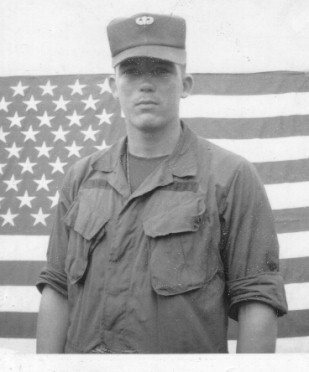 Having recently reached out to re-connect with several friends from my Vietnam days, I found out that two of them, Dave Laymon and Berkle Hodge, had died before I got in touch with them. I want to encourage any of you that are thinking about contacting your old buddies to do it now! Don't wait until it's too late. I want to give special thanks to Skysoldiers, Billy Soza, Charlie Rolon and Jim Chieco for the use of some of their photos on this site! Thanks Bros!